Satisfying my food cravings, one bit @ a time. Bend Fish Company has fresh seafood to cook at home or order from the menu. Unlike many fish markets, there is no strong fishy odor. You order at the counter or at the sushi bar. There are great Happy Hour specials Mon-Sat 2:00-5:30 & Sushi all day Sunday. Bend Fish Co is among the best Fish Tacos, Fish n Chips & Sushi places in town, or the whole west coast for that matter. If you decide to do Fish & Chips, Bend Fish Co has several great options; New Zealand Red Cod, Black Tiger Shrimp, Pacific Wahoo, Wild Salmon, Farmed Catfish, Small Oysters, Razor Clams, Alaskan Halibut, ranging from $8.25-$10.95. Pick a cole slaw; Peanut Coconut, roney Poppyseed or Cilantro Lime. Last but not least, pick 2 tartars; Cabo, Traditional, Rasta, Cap’n Dicks, Sicilian, Tokyo, Bombay or Cajun. If you go during happy hour, only 3 Fish n Chip options (unless you want to pay full price for the others) Catfish, Cod or Salmon. For happy hour, my favorite is Salmon, full price, my favorite is Shrimp or Clams. Peanut-Coconut is my favorite slaw but the Cilantro-Lime is the healthiest. You can’t go wrong with the tartars but I usually go Tokyo plus another choice at random. My husband always has the Cajun. You really can’t go wrong with any combination. I had bones in 1 piece of salmon on 1 visit but usually these are without bones. 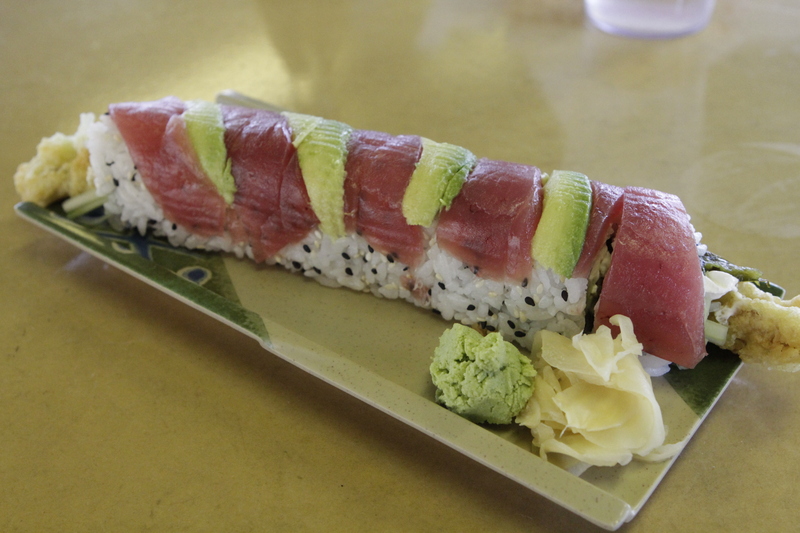 Bend Fish Co seems to be as good or better than many other Sushi options. I am not an expert in this area. I tend to prefer “California Rolls” because I don’t usually go for uncooked meat but my husband loves Sashimi. I don’t have a regular menu but here are a few of our favorites off the Happy Hour menu; Yellow Tail $4 (Nigiri 2 piece) or $10 (Sashimi 7 piece), Spicy Thai $4.75 (6 piece), Smoked Philly $6 (8 piece), Dragon $10 (8 piece).